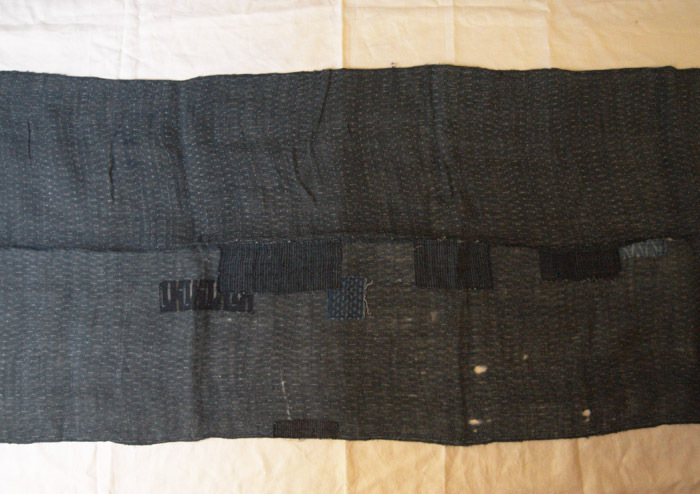 2014/11/22 | Filed under Linen | Tags bast fibers, hemp, Linen, ramie, textile history. In 2009, I made a presentation about ‘Asa’ (= bast fibers in Japanese )at Artextrina conference held at University of Leeds in UK. In Japanese, we have a term ‘asa’ ‘麻’ which means ‘bast fibers’. When we say ‘asa’ , there are several different plant variations; hemp, ramie, linen, kuzu-fu (葛布、Kuzu is pea family, Pueraria lobata), Basho-fu (芭蕉布　Basho is a plant belongs to the same family as banana, Musa basjoo) and so on.It is said that there are nearly 20 species as material for bast fibers here in Japan. Cotton is not included in ‘asa’ , instead we say ‘men’ or ‘momen’ to differentiate cotton. Normally from the word ‘asa’, Japanese people can imagine the dry, natural and somewhat stiff fabric made from plant stalks. In ancient times, hemp and ramie were the most popular ‘asa’, but nowadays, linen has become the most popular ‘asa’ in Japan. Hemp is not native to Japan, but from alcheologic studies it is said that hemp had been used in Japan already around one thousand B.C.. Hemp can be grown in any soil including poor soil, narrow mountain areas and in colder climates in northern parts of Japan. 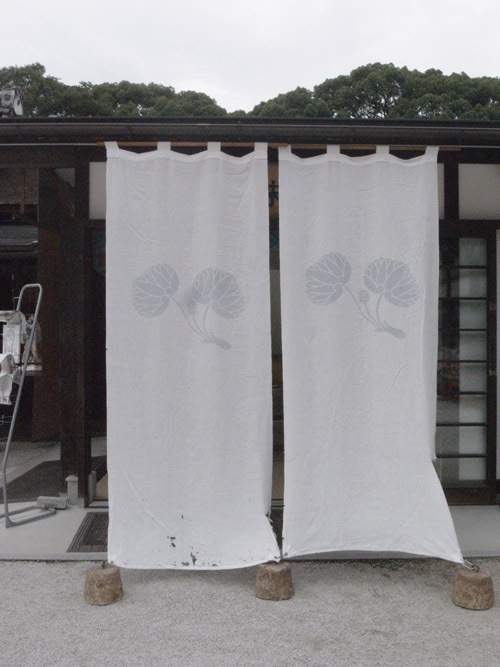 It is used not only for clothing, but for rope, Kaya (蚊帳　=mosquito net), Noren (暖簾　= entrance curtain), zabuton (座蒲団= cushion) and the edging of Tatami (畳) flooring. Hemp is also considered to be a holy plant in Japan. Firstly, hemp is important in Shinto (神道), which is an indigenous religion to Japan. Shinto is considered an amalgam of several streams of folklore religions. 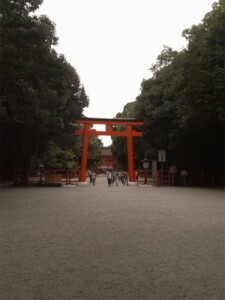 Shinto is not based on a written doctrine, but based on the worship of nature and ancestors. That is to say, it consists of, respect to, and fear of, nature. As you can see in the photo, Shinto shrines are typically surrounded by trees and forests, with a large entrance gate called ‘Torii’ that designates the divine place from the common place. Hemp is used to make the ceremonial clothing of Shinto priests, and for Nusa (幣 = a white fringed stick to be shaken in rituals). 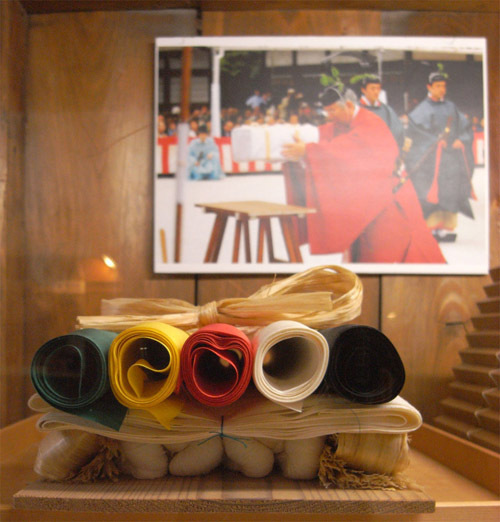 The emperor as the top archbishop of Shinto, dedicates hemp cloth to the shrine at the time of the major ritual. ↑hemp and silk clothes are the important alliterate in Shinto. The white clothes and the bunch of fiber are hemp. The word ‘大麻‘taima’ which literally means hemp is also used to mean a talisman. It is not clear how and why hemp gained the status of a holy plant in Shinto. We are tempted to imagine that the ancient Japanese Shamans used the psychoactive effect of the hemp plant to hear ‘the voice of gods’; such voices are central to the teachings of Shinto. But it is not formally discussed in Japan, as we cannot find any written evidence. Another interesting issue, as you know, the latin name of hemp is ‘Cannabis’ which is said to have its origin in Schytian or Trachian language. In Shinto, there is a word pronounced ‘Kamnabi’ (神無奈備) which means ‘the place of the gods’. It should be noted the pronunciation of ‘kamnabi’ is similar to ‘Cannabis’, but the exact relationship remains unclear. In ancient Japan, ramie, called ‘Karamushi ‘(苧) was perhaps the second most popular crop for fiber production, following hemp. 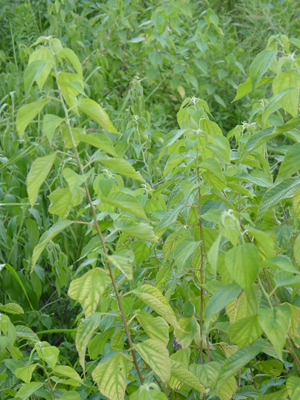 While hemp (Cannabis sativa) is a yearly crop, ramie (Boehmeria nivea) is perennial and easily found, sometimes abundant in wild habitats in Japan, except in northern areas. I have mentioned that hemp was considered a divine plant, but to the contrary ramie has never gained such a kind of holy character, instead regarded as a naturally occurring , ‘easy to access ‘plant. 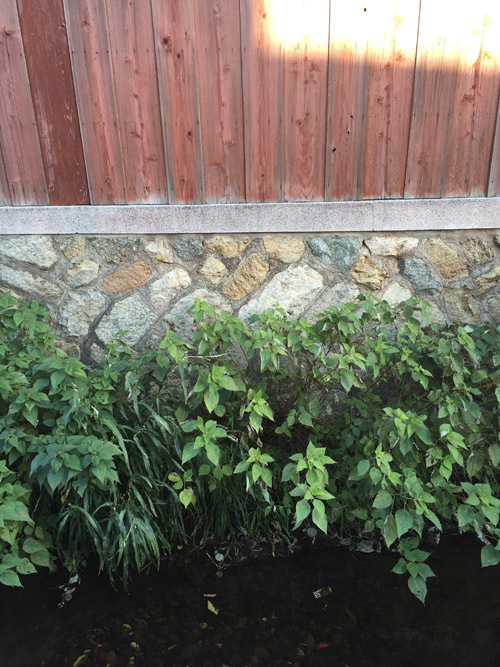 However, these 2 materials have been variously confused throughout Japanese history. This ambiguity mainly derives from the fact that hemp and ramie fabrics look similar to each other. 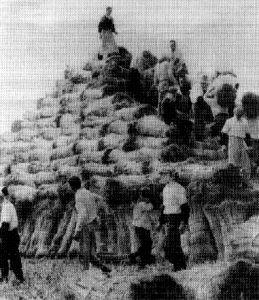 Or sometimes no clear discrimination for the material was required actually at that time, because sometimes hemp and ramie were used together to make one fabric, like warp from hemp, or weft from ramie . By the 7th century, the ancient government had established rule over mainland Japan, and had introduced a taxation system called So-yo-cho(租庸調). 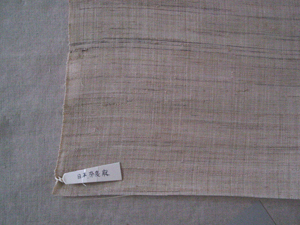 In ancient tax records, vegetable fibers including hemp and ramie were sometimes indicated by the term ‘nuno’ (布), which simply means ‘fabric’ nowadays. 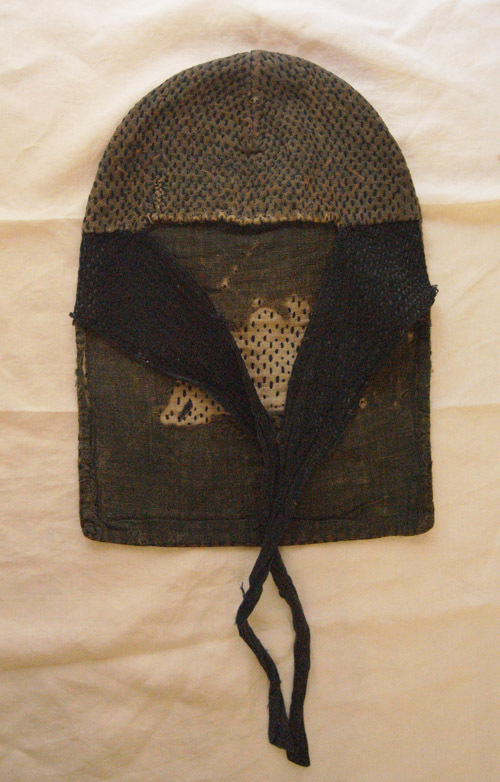 Thus, by the term ‘nuno’, it was impossible to identify which material it was made from, just like our modern term ‘asa’. By the middle ages, some of those regions had established a reputation for their ‘asa’ production. At the same time, ramie or hemp fiber ‘Ao-so’ (literally means,Green hemp or green ramie) was in wide distribution. This fiber was sold at markets in big cities, so city residents who could not raise their own crops, were able to obtain raw material to make yarns and clothes by themselves. It must have been a good way for farmers to get income, and for city residents, it must have been a good way to save on the cost of their clothing rather than purchasing expensive woven fabric. Those ‘asa’ fibers and fabrics were indispensable in Japanese daily life, until the end of the 15th century, when cotton was introduced via China and Korea. Making fabrics from cotton was far easier than using ’asa’. As a result cotton production increased very rapidly, boosted by the demand for it in daily use and also for military purposes (uniforms for soldiers, flags andso on). The era was an age of civil war in Japan, so the weakened government had no power to organize a tax imposed on cotton. For that reason, cotton became the first commodity in Japan to be distributed under the free economy. 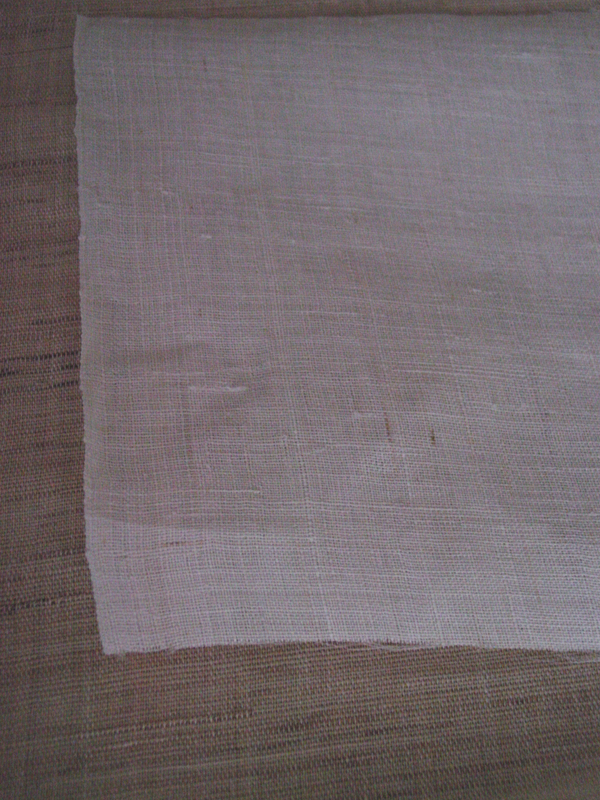 As cotton fabrics had taken the place of ‘asa’ as the preferred fabric for daily use, ‘asa’ became a kind of ‘luxurious’ material for summer and other special occasions, or remained as an old fashioned self-sufficient material especially in the northern regions which were not suitable for cotton cultivation because of its climate. In 1868, after the end of the samurai government in Edo (江戸 = ancient name of Tokyo), the reign of Emperor Meiji began. This period was notable for the introduction of modern technology to Japan following the lead of western countries. 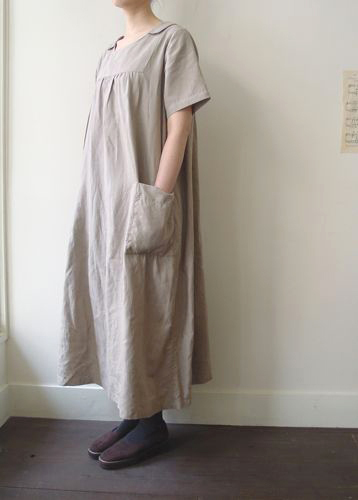 Under this policy, linen was introduced to Japan for military purposes, in keeping with the prevailing western style. 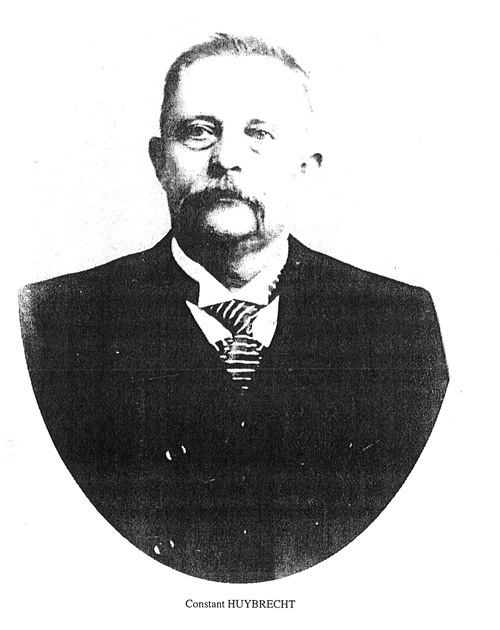 Hokkaido was selected as a suitable area to grow flax, and Constance Huybrecht(1851-1922, lived in Wevelgem in Belgium), as an expert instructor, was invited from Belgium. In 1887, the Teikoku Seima Kabushiki Kaisya (Imperial flax and linen Company) was established, and as a consequence the flax and linen industry in Japan grew remarkably. 1 ) Linen was introduced for military purposes, the urgent need of the nation. 2) A Linen industry was already well developed for mass production in Europe, and Japan could simply import the whole industrial system from the West. 3) Japan have had long tradition for producing the other bast fibers, so those pile of the knowledge makes Japanese feel open to accept new bast fiber, linen. 4) The era was the rapid growing and industrialization associated with the new political system-democracy-,which were under huge influence from western countries. It gave Japanese mentality that all things from western world is good or developed. Linen and flax could be prevailed and gained popularity because of this mentality. 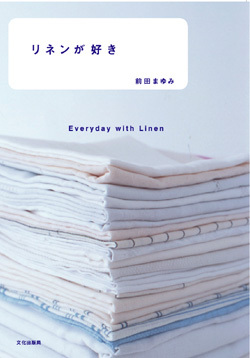 Linen had been called ‘Lin-ne-ru’ in Japanese at that time, and also this term played a role in some literatures in that age to convey intellectual or westernized way of life . 5) Practical reason: Finer yarns are easier to make from linen than hemp and softer yarns are easier to make from linen than ramie. 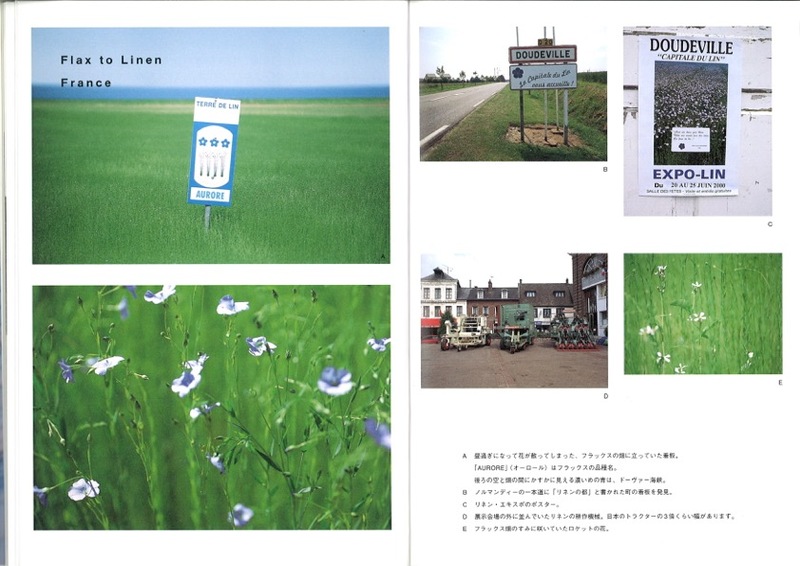 ↑　Very rare photos of Japanese flax industry as an agricultural sector at the end of 19C. photo courtesy by Teikoku Sen-i. By the time of World War I, the Japanese linen industry had developed and reached a level sufficient to produce very fine yarn and fabric. Japanese linen was exported to Britain, India and southeastern Asian countries because of supply interruptions caused by the war. From that time, the linen industry was recognized as a ‘profitable’ business in Japan. 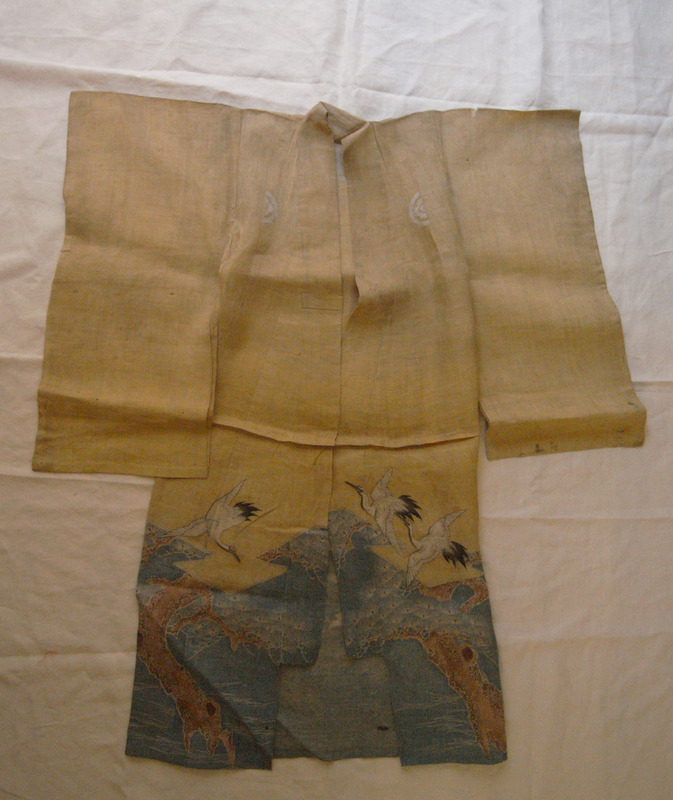 Even though the linen industry had developed rapidly, hemp and ramie production had also continued as an art and craft in traditional production areas such as Echigo, Ohmi, and so on mainly for Kimono(着物). (Japanese traditional wear). At the time of rapid growth of linen industry in the first quarter of 20tn century,manufacturers who were involved in traditional hemp and ramie production and distribution were rather reluctant to change their ways to mass production. However, due to the influence of the linen industry, ramie production tried to develop to meet the needs of the mass market. 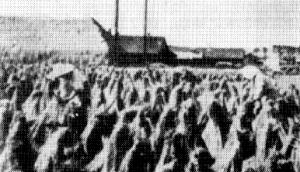 After the popularity of linen declined because of the introduction of synthetic fibers at the end of the 1960s, flax cultivation disappeared in Japan. Now Japan relies 100% on raw materials imported from overseas. Because of the shrinking market for linen as a result of the decline in military demand, no large weaving mills are in operation in Japan. In 1948, whilst under US occupation, ‘the Cannabis Control Law’ was passed. 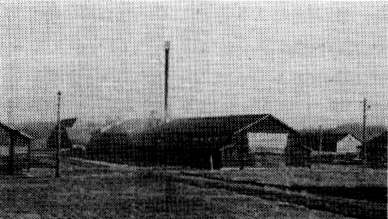 Hemp cultivation was strictly limited to licensees, mainly Shinto shrines. Hemp came to be regarded as a kind of ‘taboo’, due to its psychoactive effect as a ‘drug’. Following this legislation, the Ministry of Trade and Industry stipulated in the Household Goods Quality Labeling Act in 1962 that only linen and ramie could carry the label of ‘asa’ (麻), while imported hemp fabrics and products could only be distributed with a label simply stating ‘unspecified fiber’. ↑bleached hemp cloth handwoven in traditional Japanese way. So the ambiguity of ‘asa’ has continued but the constituent materials have changed. It is a pity that, in modern business thinking, ramie is sometimes mixed with linen to cut costs using the label ‘asa’, because ramie is less expensive in Japan. Looking back in history, we can say that, within ‘asa’, hemp was traditionally regarded as a divine fabric, but it has recently been replaced by linen. These days, argument is getting more often that the strict control for Cannabis should be removed, and there are the possibility the Cannabis or hemp will be lifted the ban. After Japan gained high economic achievement in 1960-1970s, Japanse lifestyle changed in a large scale. Amongst consumers, with more opportunities to travel abroad, recognition for the specific material ‘linen’ has grown. ↑’Linen ga Suki’ (Everyday with Linen):Author:Mayumi Maeda published in 2002, from Bunka Publishing Bureau. After writing the book about linen in 2002 and having it published, I had received the massive reactions from the readers. The most empathyzed point was the sustainability gained eventually from its durability and holy image that I have mentioned in that book. There are many Japanese trend leaders such as magazine stylists , life style book creators ., etc who had played major role to re-introduce innovated image of linen. They often have met linen for the first time as antiques. 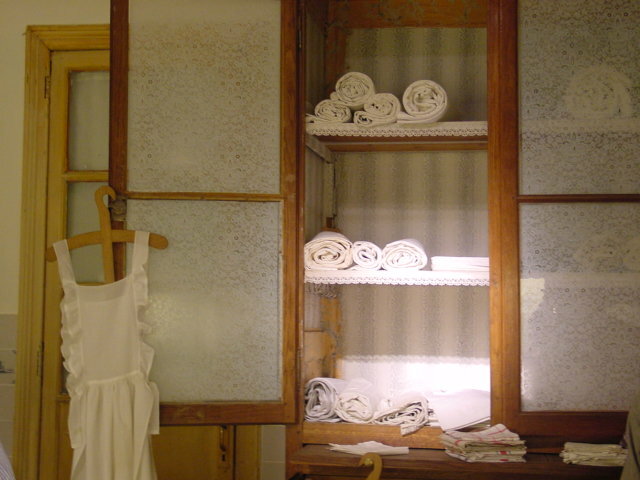 The whiteness conveys holiness and purity in its image,and antique linens stored in the linen cupboard as a trousseau looks like promising happy and healthy life. Also the pure image of linen is very friendly with the simplicity and serenity which is most favorite of Japanese culture. Now linen ended up its role in military or the other hard substantial purposes, then it became an emotional icon of what Japanese really value in its culture from ancient time. Also wearing linen garments like the girls in Kate Greenaway’s illustrations, is still being one of popular trend in Japan. I consider this is not only because of its relaxing function, but also it can be suited Japanese culture in which we have basic restrain toward sexual appeal, or excessive awkwardness to show the body shape more Japanese female have in mind than in western culture. Additionally Japanese consumers are attracted by the image of linen as an icon of ‘purity’. That 19th century girl’s style, denoting the image of virginity strengthens the holy image of linen. By the way, I have mentioned in previous chapter that in the late 19C, at the time of the opening of the country and pursuing development to catch up western civilization, Japanese gained the idea that all things from western world is good or developed. However on the other hand, in my view, Japanese have had the same kind of idea all the time from ancient time. Located far extreme of the east, far from everywhere, Japan is in a remote geological condition. It is also the goal of all the people with their own culture from everywhere in Eurasian continent, sometimes as refugee evacuated from their own land. Throughout the Japanese history, we can always find many influence originated from the continent, not only from China and Korea, but also Persian, Indian, Mongolian or ancient Jewish, and also European. Thus Japan is a unique country which has initially very positive attitude toward ‘foreign’ culture. In ancient time, Japanese learned letters from China, and many developed knowledges were introduced from the continental countries. That history formed Japanese mentality which tend to regard anything from foreign countries are basically good or intelligent. In addition, basic idea of Shinto, in which 8,000,000 gods exists in nature , is also back-up to respect any foreign religion without harsh conflict (as long as it is not anti-social cult). It may sound disrespectful for some people, but Japanese mentality accept any foreign god as one of 8,000,000 gods. So Japanese can happily cerebrate Christmas, for example, even if they are not christian actually. Therefore, I consider that Japanese rather emotional evaluation toward linen has a relation to that mental tradition in Japan. Additionally, the earthquake and nuclear plant disaster in Japan in 2011 was crutially influential on Japanese mind . People are getting more nervous about environment and health. Asa, as nature friendly or environmentally harmless fiber is becoming one iconic image of sustainability. From the consumer’s point of view, the ambiguity of the quality of the label ‘asa’(麻) can cause some problems, because linen and ramie should be treated in different ways. Linen can be machine-washed without any problems, but ramie should be hand-washed because its fiber can be heavily wrinkled in machine washing. Indeed, it wasn’t a big problem at the time when washing machines were not in use, but nowadays with machine washing, it can cause problems. However, the more controversial issue is that, because of that bast fiver mixing up tradition and the convenient and ambiguous term ‘Asa’, many people in Japan do not have clear knowledge about the material of Asa. Most people knows cotton plant, but very few people know real flax, hemp and ramie plants, or even they do not know ‘asa’ has such variations in materials. Thus, in some occasion, ramie and linen are confused, or intentionally mixed to get the price lower. Ramie can be added in flax fiber, then can be legally sold under label ‘Asa’ in Japanese market. For the daily use, it is very tricky though. To protect fine linen quality, the traceability for the process of ‘Asa ‘ yarns production is required. 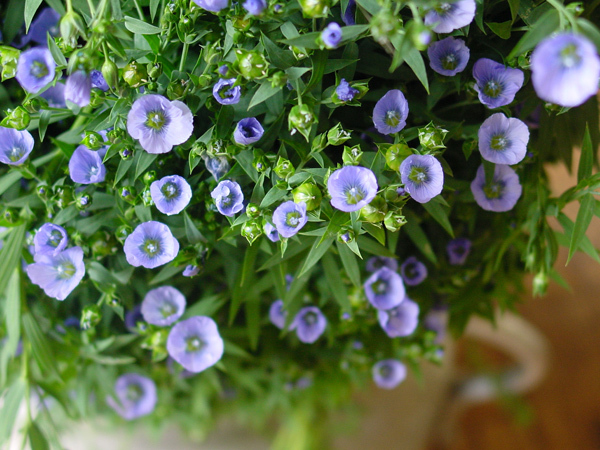 And, If it is ramie mixed flax and then less expensive, that should be clearly indicated for end users. However on the other hand, I personally have a thought that we should value ramie as well, because it has a long tradition in Japan, and many people in Bast fiber industry are involved in ramie manufacturing. Clear indication of the material and the accurate information should be given without damaging the ramie image and its industry, avoidingto be a kind of negative campaign of ramie. 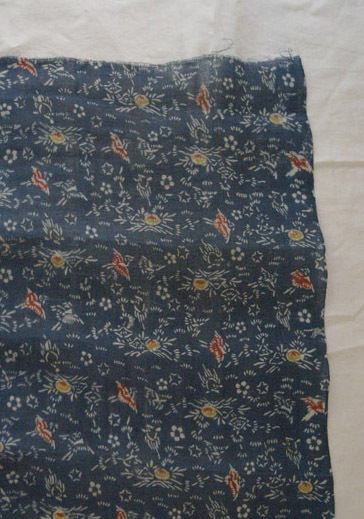 ↑antique patterned Asa cloth for Kimono.We cannot tell the actual material, ramie, hemp or mix.